Trendy, colourful and with a Mauritian touch, the Mauricette t-shirts have become very popular among the locals as well as tourists visiting the island since the past two years. Valery and Camille are two intuitive persons who have combined their artistic and entrepreneurial flairs to create this unique product. They share with us their pathway and why we should promote more locally made products. You must have definitely come across someone wearing it, or you know a person who owns one or you have yourself bought and gifted it to someone special. The Mauricette t-shirts are everywhere. 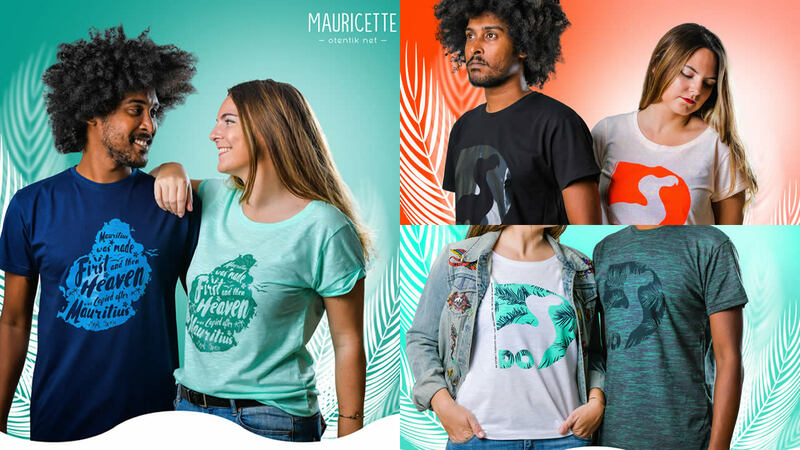 Created by Valery Charles and Camille Bérenger, Mauricette offers a wide range of stylish vibrant t-shirts perfect for summer and for any relaxing day out. Valery Charles, a Mauritian, aged 30, studied at Charles Telfair Institute and works as Artistic Director while Camille Bérenger, of French origin, holds a Master's degree in Marketing and Communication and works as a marketing and communication teacher at MCCI Business School and Vatel, in parallel with her entrepreneurial activity for Mauricette. As a child, Valery dreamt of becoming a professional triathlete and Camille, a fashion designer. Both also share a common passion for arts and crafts. “Valery and I are very hands-on. We love to create things, draw, and paint. I always found that craft products have an authentic soul. We also both have a passion for entrepreneurship,” shares Camille. Together as a couple for three years, the love birds share how the idea of launching their enterprise blossomed. “In December 2015, at the end of my 6-month internship in Mauritius in a communication agency, where I met Valery, we were looking for Mauritian souvenirs that I could offer to my friends and family for Christmas. I went to many shops and bought local food items but in terms of souvenir t-shirts, I did not come across something I liked. They were either made in China or were too juvenile. I love to offer souvenir t-shirts from the countries I visit. That's how we came up with the idea of creating our own brand of quality souvenir t-shirts, which are produced locally and which can be worn every day, whether here in Mauritius or abroad.” It is in July 2016 that Mauricette saw the light of day. “At first, we did not really exactly know where we were heading and therefore, we tested the market. It is in January 2017 that the business really took off,” says Camille. The couple and business partners focus their brand on three major characteristics – fashion, quality and the Mauritian touch. “The concept is simple - to offer tourists the opportunity to take back home a trendy and good quality, Mauritian souvenir. In addition, Mauritians get a t-shirt that showcases their culture,” explains Camille. Mauricette thus offers t-shirts in various colors and sizes starting from three months to 12 months for babies, from Small to Extra Large for men and women and from two to 12 years for children. The fabrics for the t-shirts are carefully selected by the pair. They then send them to a textile workshop which takes care of the cutting and sewing process; the final destination is a serigraphy shop that prints the designs. The t-shirts go through a quality control check (washing machine test, ironing) before being packed. “All these stages are carried out in Mauritius only,” utters Camille. Mauricette also proposes accessories like handbags and jute pouches and has recently released their new summer collection 2019. “In total, 10 new designs have been added to our collection. Our best sellers from last year namely the t-shirts with the Dodo, ‘Mo kontan twa Moris’, ‘I need Vitamin Sea’, among others, are still popular but we are proposing them this year in new colors trends version summer 2019. We also create custom collections for distributors,” explains Camille. Mauricette plans to release a new item this year, which is swimsuits for men. The young couple advises the talented Mauritian youth not to hesitate to launch their own business. “We still consider ourselves as young talents needing advice to grow up. This is the first time we have been asked to give advice and it touches us. For young people who want to get started, we advise them to talk about their project. Do not be afraid that others will be stealing your idea. For a project to grow and improve, it needs the opinion and support of your loved ones. Economic Indicators for 2019 : high investment and higher debt?